How Far is Bhagini Suryodaya? Suryodaya Enclave is located off Mysore Main Road, on banyan Tree approximately 24 Kms from the city centre and about 8 kms from Nice corridor which connects Mysore Road, Electronic City (Hosur Road) and the Tumkur Road main Road. The suryodaya Enclave comprises over 100 plots, on the sprawling 10 acres of lush greenery. As far the layout is concerned, it's being well-planned with space for everything which makes life comfortable. There are green pockets for kids to play and elders to take strol. 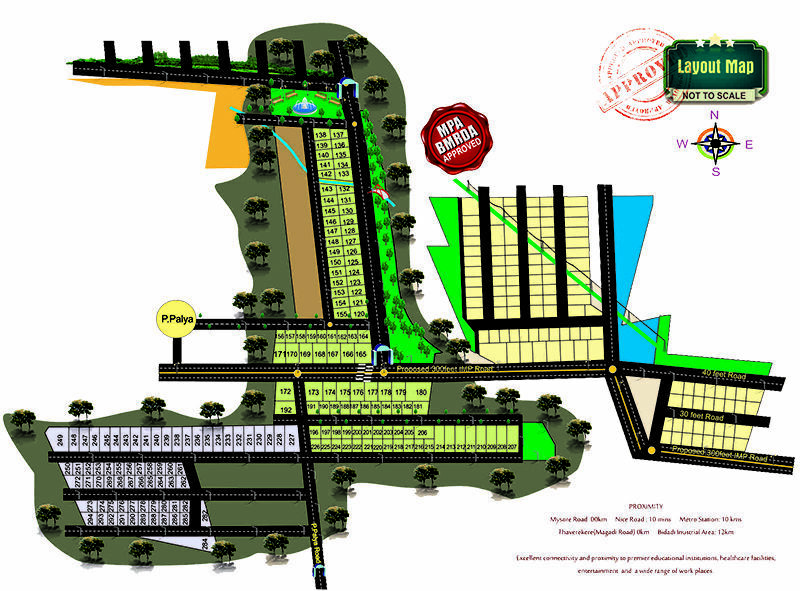 The plots are of various sizes, which you can choose as per your budget and needs. 30x40, 30x50 & odd sites. Mysore Road - 0 km Nice Road - 10 mins Metro Station - 10 kms Magadi Road - 0 km Bidadi Industrial Area - 12 kms Excellent connectivity and proximity to premier educational institutions, healthcare facilities, entertainment and wide range of work place.